Don’t waste any more time on out-of-date, inefficient or poorly working pool or hot tub equipment. Let Aqua-Tech help you love your pool again with our extensive range of parts, accessories and expertise! Find Pricing and Availability for Parts & Accessory Here! Searching for the price or availability of a particular product? Let our team help! Enter a few simple details and we will get in touch to provide you with the information you want. You deserve to have your swimming pool or hot tub run smoothly and efficiently so it’s ready when you need it. Aqua-Tech’s range of parts and accessories will help you ensure that whether you want to maintain the perfect water temperature or reduce evaporation or anything else, you’ll find what you need without having to look any further than our store! Aqua-Tech carries an extensive range of replacement parts for swimming pools and hot tubs, including filters suitable for all makes and models, heaters, pumps, custom covers and much more. Our team can recommend the best product for your usage and habits while providing advice about how to prevent the same issue from reoccurring. Keeping your swimming pool or hot tub in peak working order isn’t just about proper water chemistry and weekly maintenance. The many working parts in and outside of your pool function together in harmony to keep your investment performing perfectly so you can enjoy it whenever you want. We know that when something goes wrong, you want the it fixed as quickly and simply as possible. We don’t just carry the parts and accessories you need. Our skilled maintenance team will also install your replacement parts or accessories and walk you through the operation of any new systems. 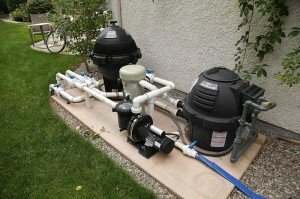 We can also provide the regularly scheduled servicing or regular upkeep to ensure that your filter, heater, cover and everything else are going to be a long-lasting addition to your backyard. Turning to Aqua-Tech, with our extensive range of premium option and knowledgable team, is Winnipeg’s best option for pool owners needing replacement parts. Shop now or get in touch today! Make your swimming pool perfect—get the highest quality accessories from Aqua-Tech! Don’t waste another day in your pool! Turn to Aqua-Tech for the best replacement filters, pumps and heaters. Get even more from your hot tub—discover Aqua-Tech’s luxurious accessories.